Since the early 20th century the nation has devoted significant resources to the creation of a roadway system that connects every major population center. Over 164,000 miles of highways in the National Highway System form the backbone of our 4-million-mile public road network. In 1989 FHWA established a Functional Classification System that categorizes roadways with similar characteristics. Our highway system comprises three fundamental building blocks: local roads; collectors; and arterials. Local roads serve homes, businesses, farms, and small communities, and provide access to collector roadways. Collectors channel traffic from local roads to arterials, which provide safe, reliable, and efficient travel between towns and cities. An ideal roadway is one that connects to our driveways (access) and at the same time leads to interruption-free drives to our destinations (mobility). To accomplish this, roadways are planned and designed differently. 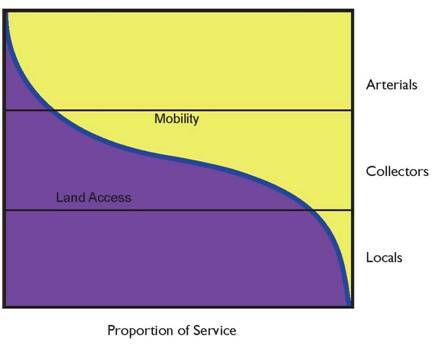 Local roads are chiefly to provide access (driveways, median openings), while mobility is the primary function of arterials. National Highway System (NHS) roadways are important to the United States economy, defense, and mobility. 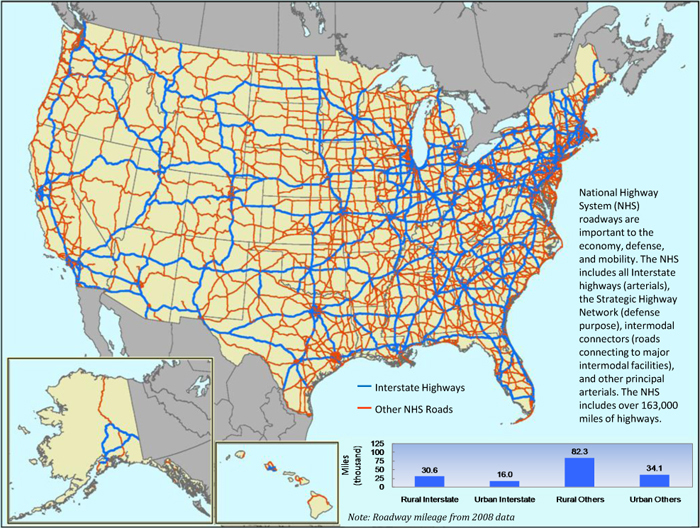 The NHS includes all Interstate highways (arterials), the Strategic Highway Network (defense purpose), intermodal connectors (roads connecting to major intermodal facilities), and other principal arterials. Currently, the NHS includes over 164,000 miles of highways. Approximately one percent of all public roads are part of the Interstate Highway System. Of these 47,000 miles of Interstates, 65 percent are in rural areas and 35 percent are in urban areas. Seventy-four percent of the remaining public roads are located in rural areas, with 26 percent in urban areas. Since 1980 an additional 183,000 miles of public roads have been constructed, an average of 6,500 miles of new roads each year. 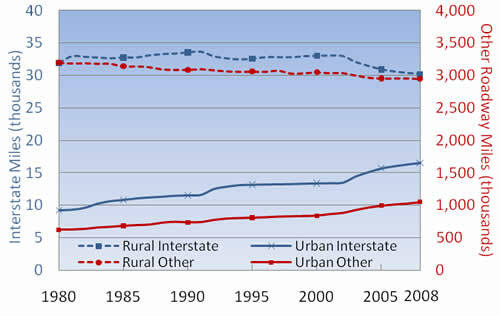 Rural public roads have steadily decreased since 1980 as these roadways have been reclassified as urban due to increases in population and geographic dispersion. At the same time a corresponding increase in urban facilities is seen partly due to urban boundary reclassification and partly due to new construction. 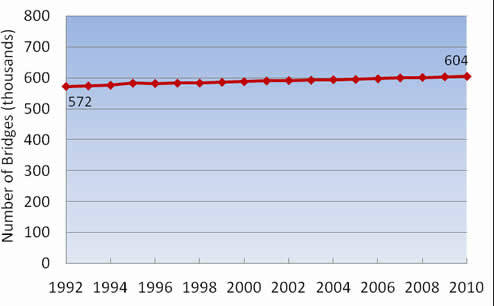 Data Source: FHWA. Note: Lane-mile data not available before 1985. In 2009 there are 4.1 million centerline lane miles and 8.5 million lane miles (an average of 2.1 lanes per centerline). 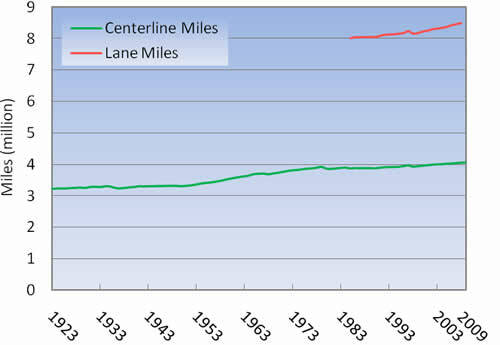 Centerline miles increased 0.2 percent from 2008, while lane miles increased 0.7 percent. Since 1923 an additional 818,000 miles of public roads have been constructed, an average of 9,500 new centerline miles every year. With the highway network largely complete, nearly all population centers are linked by paved roadways and virtually all counties are connected by the Interstate highway system within the 48 contiguous States. Lane-miles increase as highways are widened to accommodate additional travel needs due to population growth in the various communities. In 1923, the U.S had a population of approximately 112 million. In 2010, the latest decennial census shows that there are 309 million people, a nearly three-fold increase in . Adding capacity to existing highways is one of many ways transportation agencies are ready to meet the needs of a continually growing population. Bridges are key components of our nation's highway system. Maintaining their integrity is critical for safe and efficient travel. The National Bridge Inventory (NBI) collects information on the nation's bridges, including those located on interstate highways, U.S. highways, state and county roads, as well as publicly-accessible bridges on federal lands. Each state is required to conduct periodic inspections of all bridges and report the data to FHWA. One of the most efficient ways to increase roadway operating efficiency is to separate at-grade intersections with bridges. In 2010 there are 604,460 bridges along public roads. Since 1992 32,264 bridges have been constructed, an average of 1,792 new bridges each year. Data Source: FHWA OHPI, Highway Performance Monitoring System. 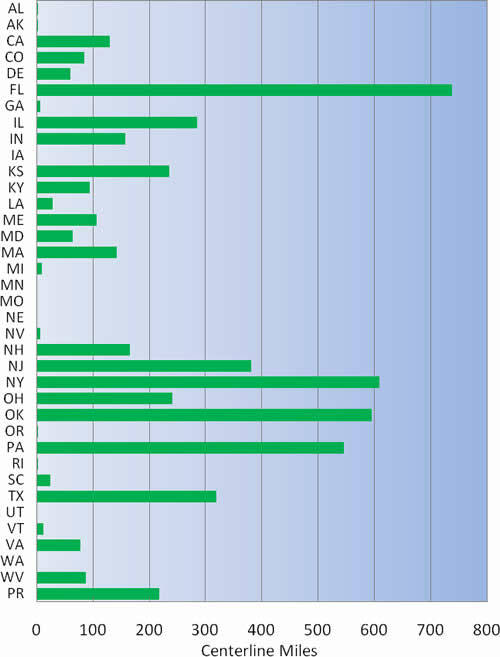 Note: States not shown do not have toll facilities. Roads, bridges, and tunnels that require drivers to pay a fee for usage are referred to as toll highways, turnpikes, or toll structures. High-occupancy toll (HOT) roads are also constructed to provide free or discounted access to high-occupancy vehicles (HOVs) while allowing single-occupant vehicles to use the facility for a fee. The fees collected from these facilities are typically used to repay the money borrowed for construction. As the debt is repaid the toll may be used for ongoing operations and maintenance. Thirty states, plus Puerto Rico, have toll facilities. The length of these facilities as they're recorded varies depending on the type (toll bridge, tunnel, or roadway). Oregon, for example, has only three toll bridges, while Florida has several toll roads throughout the state, including the 300-mile-long Florida's Turnpike. While the vast majority of Interstate highways have no tolls, approximately 2,900 miles of Interstates are tolled in 21 states. These tolled facilities range in length from 500-mile New York State Thruway to tolled sections of I-95 in Delaware and Maryland.